There are still a few more days where visitors to the Palatine Gallery, Modern Art and Silver Museum at the Palazzo Pitti and at the Medici Villa della Petraia will have the opportunity to study a famous work of art “up close” with an expert. Right in front of the work of art an expert will give a short presentation of the artist, the work’s history and highlight its particularities. It is a great way to discover works of art you might have glided past in your tour of the museum and an expert can open up doors to an appreciation of art you haven’t had before. The presentation will be repeated a few times in the 2 hours offered, both in English and Italian. 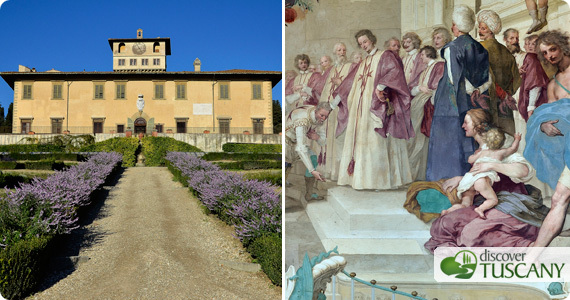 This last one presents a wonderful opportunity to also visit the Medici Villa della Petraia in the outskirts of Florence (not very far from the airport, to give you an idea of how close it is to Florence’s center). It is an opulent villa, having been a favorite residence for the Medici family as well as of the Lorraines and then of the king of Italy during the brief period the city was capital of the country. The beautiful ballroom is the site for the short conference on the frescoes by Volterrano depicting stories from the Medici family, and after that enjoy a tour of the rest of the villa and its beautiful terraced gardens. Read more about the Villa della Petraia so you know what you’ll see and how to get there.